During the meeting the bishop of Rome emphasized that the patriarch’s visit strengthens the fraternal bonds that already unite both churches. He mentioned as milestones of the common path towards unity His Holiness Abune Paulos’s encountered with St. John Paul II in 1993 and with Pope Benedict XVI in 2009, who invited him to participate in the Synod of Bishops for Africa as was common practice in the early church for representatives to be sent to the synods of other churches. Likewise, a delegation from the Holy See was present at the 2012 funeral of Patriarch Abune Paulos. The meeting comes at a time when Ethiopia is facing tremendous challenges. As we’ve reported in our magazine, the country is undergoing rapid urbanization and contending with the worst drought in decades. 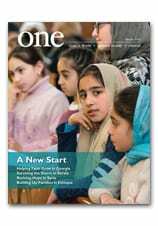 To learn more about the Ethiopian Orthodox Tewahedo Church — and its rich history in Africa — check out our profile from the May 2010 edition of ONE. Spring has arrived early in New York City, and, during a much-needed spring-cleaning of my desk, I uncovered this memento from a trip to the Holy Land back in 2013. I met the little artist who drew this card at the Infant Welfare Center, in the Christian Quarter of the Old City of Jerusalem. He’s one of about 27,500 Palestinian Arabs who, since Israel seized the Old City in 1967, still live within its ancient stone walls. Jerusalem is a prosperous place, but many of the Palestinian families are deeply poor. The children of the Old City suffer from overcrowded housing, a lack of access to health care and limited educational opportunities — as well as a permeating mood of frustration and hopelessness. At bottom, they’re victims of the conflict between Israel and Palestine. But behind the heavy metal door of the Infant Welfare Center, I didn’t see any suffering. The happy shouts of children filled the 700-year-old building with joy. The center is a program of the Greek Catholic Annunciation Society and houses a kindergarten, a health clinic, tutoring for at-risk teens and other services that address genuine needs of the Palestinian children in the Old City. It’s a very impressive place. The youngsters I met there were just four or five years old, but the center was already teaching them English. We sang “Row, Row, Row Your Boat” together. Now that the card has been rescued from the bottom of a drawer, it’s hanging on the wall above my desk. And I want to thank you for the wonderful memory. Because the Infant Welfare Center is supported by your generous donations to CNEWA. In this image from January, a priest gives Communion to a woman during a Mass for Iraqi Christian refugees at Our Lady of Peace Center on the outskirts of the Jordanian capital, Amman. The status of religious freedom in the world is not something to celebrate these days. The situation in the Middle East remains dire. Hundreds of thousands of people have been displaced, and religious minorities are being persecuted and slaughtered. But this sad state of affairs is not unique or limited to that region. South Asia has recently seen a disturbing increase of sectarian violence against Christians and Muslims. Together the Middle East and South Asia are home to most of the major religious traditions of the planet. Not surprisingly, they are also home to many of the violations against religious freedom. “Freedom of thought, conscience and religion” is guaranteed as a human right in Article 18 of the Universal Declaration of Human Rights, to which most countries of the world have bound themselves by treaty and international law. Nevertheless, the sad fact is that abuses against freedom of religion are probably the most widespread and varied of all abuses. Issues involving the freedom of religion vary from the requirements of the Affordable Care Act in the United States to the genocidal tactics of ISIS in Syria and Iraq. They run the gamut from the legal to the existential. Read the full essay at the America link. Meantime, check out the Sirius satellite radio interview below, which offers more from Father Elias on the topic. Among the many joyful aspects of working for CNEWA, one of my favorites has been helping to expand our Parish Awareness Program. This role has taken me, along with my colleagues Deacon Greg Kandra and the Rev. Elias Mallon, across the country to a variety of parishes, in order to share our mission and work. This past weekend, Deacon Greg and I took CNEWA’s message of hope from coast to coast — literally — as we traveled to St. William’s Parish in Atascadero, California, about 30 miles north of San Luis Obispo. Deacon Greg preached at the weekend masses, connecting CNEWA’s work to the theme of “light” present throughout Sunday’s readings. Across the Middle East and beyond, he explained, Christians’ light of hope is flickering, and in danger of going out. Through our regional partners, including the Dominican Sisters of St. Catherine of Siena in Erbil, Iraq, CNEWA is helping to ensure that Christians and other persecuted minorities have the resources — and the hope — to sustain themselves through hardships that few of us could imagine. We’re especially grateful to a few wonderful people at St. William’s for making our visit such a success. Deacon Rick Minton, the parish’s Pastoral Associate, and his wife, Debbie, made sure we were well-fed and well-rested. The pastor, the Rev. Edwin Limpiado, welcomed us warmly and gregariously. It quickly became clear that he is well-loved by his flock! We also met Gabriel Okafor, a seminarian of the Diocese of Monterey who is doing his pastoral year under Father Edwin. Overall, it was a wonderful visit, and, as I am at every parish visit, I was touched by the large number of people who stopped by to make a donation and learn more about us. It’s gratifying to meet such engaged, caring people who want to make a difference, and it’s an honor to welcome them to the CNEWA family! If you’re interested in having CNEWA visit your parish, and spread our mission of hope, please do not hesitate to contact Norma Intriago, Director of Development, at nintriago@cnewa.org.